One of Korn's most instantly recognizable musical ingredients has always been their detuned guitar riffs, played on seven-string instruments – originally supplied courtesy of Brian "Head" Welch and James "Munky" Shaffer. But for nearly a decade, one half of the equation has been absent: Welch initially exited in 2005 to sort out a drug addiction before finding solace in Christianity. 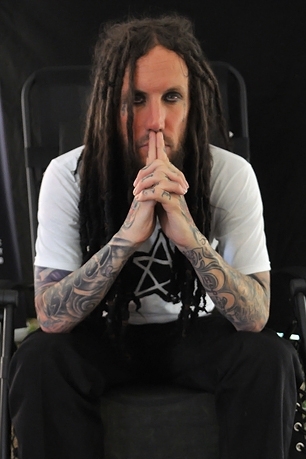 Now Welch is ready to reclaim his position in Korn; he will rejoin the group for live dates later this year. "I played one song last May [at the Carolina Rebellion Festival]," Welch tells Rolling Stone. "I showed up at that festival – I was on tour with POD, and we had a few days off. They had a big festival, and Korn, Evanescence and Five Finger Death Punch were playing. I wanted to go and my daughter loves those bands. So I took her, and I was just going to go hang out. "Then I met up with Munky, who I hadn't seen in seven years, and talked with him for 30 minutes. It was really heavy. Then, 10 minutes before they went onstage, [bassist] Fieldy is like, 'I'm just saying, we have a guitar set up for you.' I'm like, 'What? I just want to see you guys! All right, I'll play 'Blind.' It was just crazy, because it was really emotional. That's what set it up. Munky called me a month after that, and he said, 'Hey, if you ever want to come back, the door's open. We miss you.'" Korn (which also includes singer Jonathan Davis and drummer Ray Luzier) will perform their first full set with Welch since 2004 on May 17th at the Rock on the Range Festival in Columbus, Ohio, before spending most of June playing shows overseas. While a set list hasn't been discussed yet, Welch wouldn't be opposed to playing a certain Korn album in its entirety. "I think that would be kind of cool to do somewhere, sometime. Like the very first [1994's Korn debut]. We're all in different places, so we're all just going to get together and talk about set lists. Obviously, all the hard-hitting, energetic classics, where people lose their mind – those will definitely be there. Because those are the funnest ones to play." Before the upcoming Korn dates, Welch will be fronting his other band, Love and Death, which just released their debut album, Between Here & Lost, on Tooth & Nail Records last week. "My first solo album [2008's Save Me From Myself] was more personal. This one is more broad, and people can relate to it more. People can get different meanings from the songs. And I've hit melody on this album that I've never done before, ever. There is also the heaviest song I've ever done before, with Mattie Montgomery from For Today [the track "I W8 4 U"]. I love my new band. I get to have that outlet. The vocals are a challenge to me, and I like facing that challenge. Even though it's probably less stressful to just play guitar in Korn – which I'm going to love that – but I love both, so I'll definitely balance them out." Thus far, Welch is pleased with the feedback he has received from Korn fans. "Everyone is broken in this world. There's so much divorce, hate and unforgiveness. For people to see this, I think it's just really uplifting. I never thought it would happen, and I'm not sure they did either. The fans just love it, because a lot of the fans back in the day were like, suicidal, and from broken homes and abuse. They looked up to us like their family. And to see their family split up was hard on them. To get it put back together, there is a joy around the people who care about it." Any chance of Stateside fans getting their Korn fill with a full tour? "We're going slow," Welch said. "We're hanging out when I've got time, but I've got my album out, and they're busy doing their stuff. But I'd say anything is possible right now." And what about the possibility of Welch and Korn working on a new studio album? "Again, I'd say anything is possible."